This item, written by Reverend William H. Honnell, contains Honnell's recollections of his life in northeast Kansas during the Kansas Territory period. Honnell relates having a boat he was traveling in searched for military equipment in order to prevent any such equipment from falling into the hands of the "free statemen of Kansas." 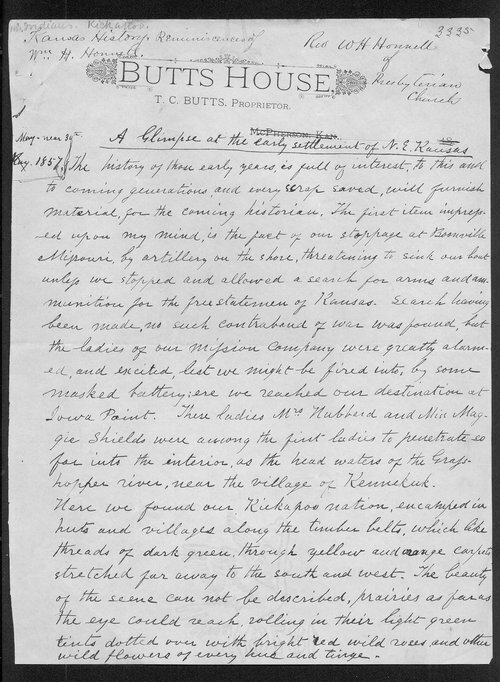 Honnell also describes arriving at the Kickapoo villages in northeast Kansas, meeting Indians in the area for the first time, the formation of the missionary settlement, and other details, including the death of Kennekuk.